Hôtel Drouot's sale of books and letters relating to the great poet and critic Charles Baudelaire proved to be a huge success, selling for €4m. Some of the autographs performed very well, with Baudelaire's (attempted) suicide note selling for €180,000 (not including buyer's premium). 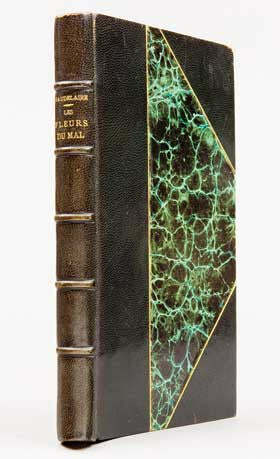 However, that was by no means the top lot, which was a first edition copy of Baudelaire's Fleurs du Mal (Flowers of Evil) published in 1857, which had been presented by him to his friend and legal advisor Narcisse Ancelle, and contained a signed note of friendship. This 12 inch tall edition, bound in sheepskin and green covers was already expected to sell for as high as €150,000, but furious bidding drove the price up, and it was only taken away for €775,000, which was a world record price for a copy of the text. Remarkably, this was not the book in the sale which performed best against estimate. 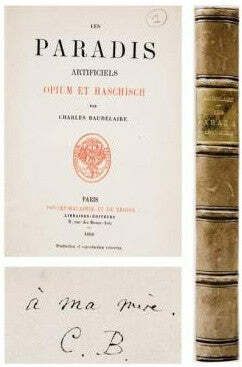 A first edition of Baudelaire's 1860 work Paradis artificiels: Opium et Haschisch (Artificial Paradises: Opium and Hashish) which was expected to sell for €18,000-25,000 made a nonsense of this valuation as eager bidders pushed the price up to a full €375,000. The copy belonged, and was dedicated to, Baudelaire's beloved mother who outlived him, which no doubt increased the significance of the text for many.